Infi MDI first measures the diastolic blood pressure and then the systolic blood pressure and gives instant result without deflating. This new technology is faster, gives extra comfort to the arm of the patient, and better accuracy in case of repeated measurements. 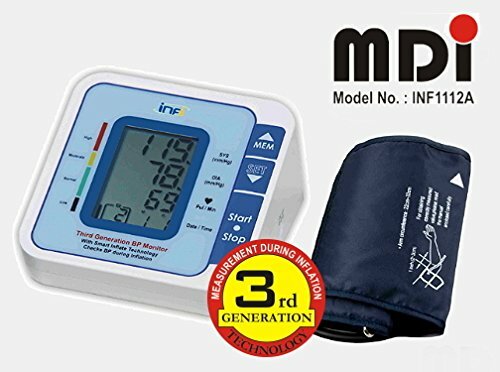 MDI BP Monitor Infi MDI first measures the diastolic blood pressure and then the systolic blood pressure and gives instant result without deflating. This new technology is faster, gives extra comfort to the arm of the patient, and better accuracy in case of repeated measurements. One of the greatest advantage of using MDI Digital BP Monitor is self measurement of Blood Pressure under the usual conditions of daily living. Our sophisticated Wrist Type Blood Pressure Monitors are an extremely useful and handy gadget and provide speedy and accurate blood pressure measurements (both systolic and diastolic) and pulse readings. Irregular Pulse Detection- The Monitor displays irregular Pulse symbol if Patient is missing a heart beat. Such Patients need medical attention. To Recieve updates and possible rewards for Infi INF 1112A Digital Blood Pressure Monitor MDI please sign in. To Recieve updates and possible rewards for BP Monitor please sign in.